Even the most winter-hardened Canadians may balk at leaving the house in minus 38 weather with an extreme cold warning in effect. Yet, that’s just what many of the Concordia faithful did on Saturday night. As the game against the Ottawa Gee Gee’s went on and the Ed Meagher arena filled up, the Stingers certainly took notice of the loud gasps and cheers that filled the often subdued rink. His captain was of the same mind. “I think I’m going to pay them to come back because it’s really working well for us,” joked Phil Hudon. Perhaps the crowd was hockey starved. Or maybe, they wanted to see them bounce back from their overtime loss to the Université du Québec à Trois Rivières Patriotes the night before. Despite the crowd’s excitement, the holiday rust was evident in the Stingers’ first period play. The early cheers were for goaltender Marc-Antoine Turcotte who stood on his head, making save after improbable save to keep the game even through the first frame. Still, frustration seemed to sink on the Stingers bench in the second as no one could give their team the lead. To solve the problem, the Stingers turned the physicality up. Forward Philippe Sanche and Hudon garnered ovations on several occasions for laying big hits on Ottawa skaters. The frustration seemed to disappear in the third period. The Stingers looked poised and hungry, jumping first on pucks and clearing the puck out of mad scrambles in their own crease with apparent ease. With just under five minutes to play, that solid third period payed off. After two missed chances in front of the net, forward Massimo Carozza grabbed the puck and slipped it to Matthieu Desautels at the point. The defender wasted no time firing the puck through traffic and right over the goalie’s shoulder. The final five minutes served as a condensed, heavily amplified version of the previous 55. As the crowd cheered on louder than ever, the teams squeezed chances through tight defenses. Both goalies made point blank saves on what looked like sure goals and skaters fell to the ice blocking any shot they could. It was on one such block that the Hudson closed out the game. After taking a puck shot to the calf, he popped right back up and carried the puck down the ice to score on the empty net. Element praised his leadership, saying how proud he was of Hudon making plays this. For Hudon, it’s good to see his team winning tight games. In December, they proved they could score in bunches on a nightly basis. Saturday night, they proved they could win the tight ones. “Teams are gonna start being on their heels when they play us,” said Hudon. 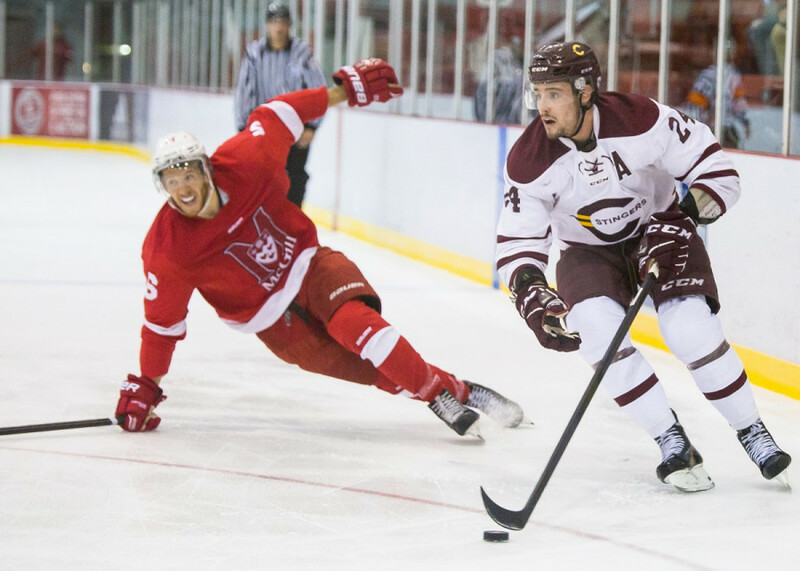 The Stingers will be back in action Jan. 12 at the Ed Meagher Arena when they take on the Université du Québec à Trois-Rivières Patriotes.